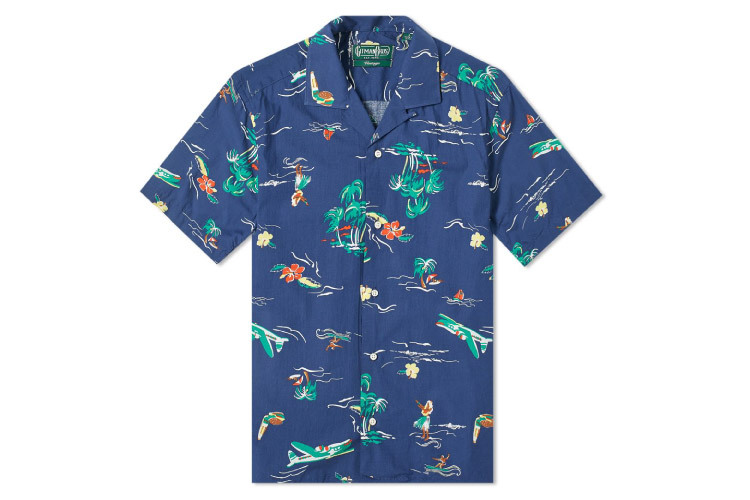 As we move towards the warmer months of the year, it’s time to start thinking shirts! 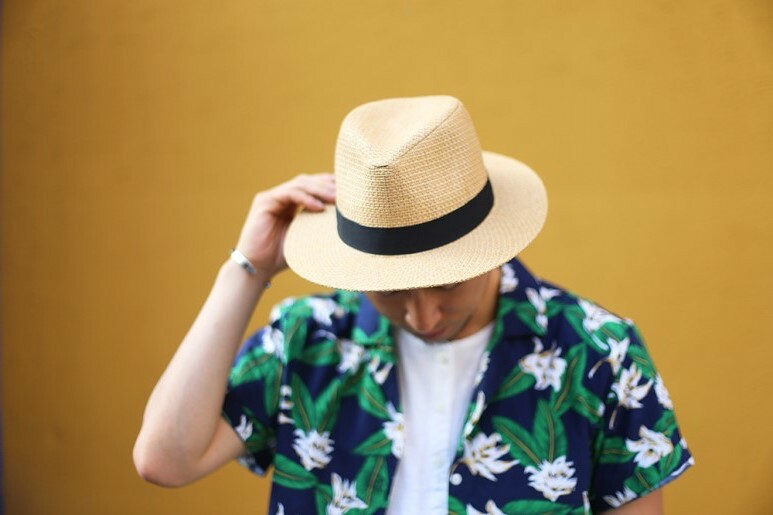 It can be difficult to balance staying cool whilst also looking good, so I’ve put together some tips and suggestions to help you stay stylish this summer. First and foremost, choosing shirts with the right type of fabric is important. You don’t want to have a shirt that looks vibrant and fits right, but you’re sweating all day long because the material isn’t breathable. Sticking to cotton and similar fabrics will make sure the shirts are comfortable to wear in hot and humid weather. Picking colors that are bright and patterned will not only look fashionable, but the brighter pigments can help reflect the sun and keep you cool. Most of my recommended shirts come in a looser-fitting boxy style, which maintains a nice shape but won’t cling to you on those warm summer days. The shirts can be worn in several ways, such as open and over a simple t-shirt or tucked into shorts, it’s up to you and your personal style. This shirt is a crisp, classic white piece with nice detailing at the affordable price. 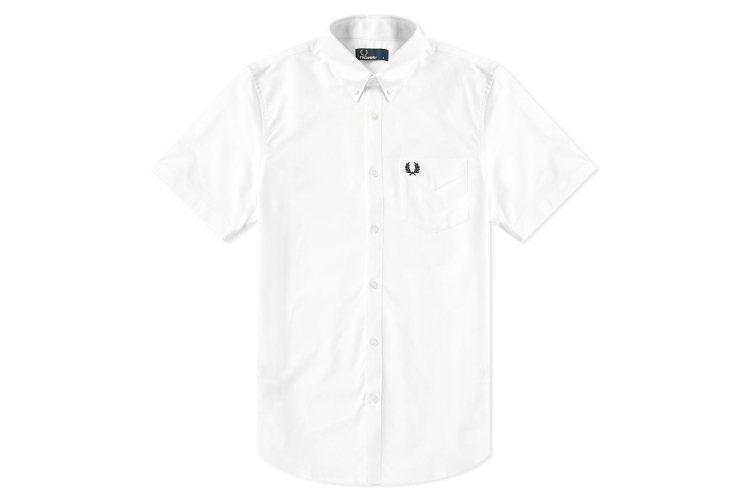 The patch pocket features Laurel Wreath embroidery and the collar is button-down, keeping its shape through any summer activities you may get up to. The simplistic color is versatile so you can opt for brighter, contrasting colors in the rest of the outfit, such as bright chinos or loafers. If earthy tones are more your vibe, this vacation shirt is a unique alternative to the classic Hawaiian printed shirt. This Portugal made, 100% cotton shirt is a great addition to any man’s wardrobe and would style nicely over a plain white or grey t-shirt. 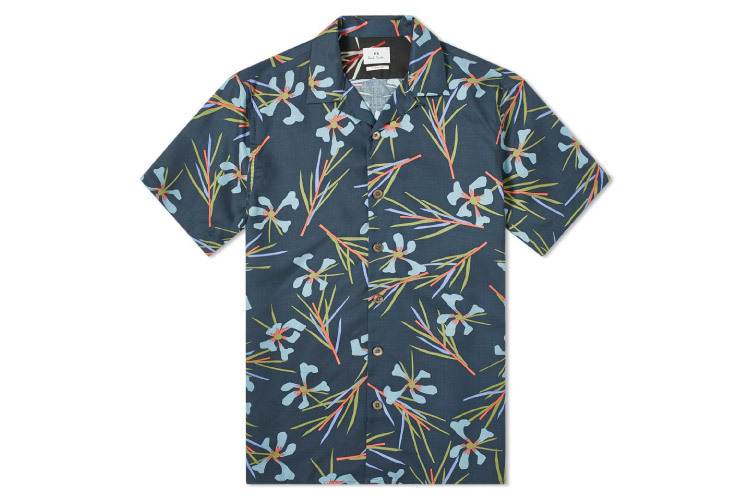 Another dark option for summer is this lovely lyocell shirt with brightly colored foliage to lighten the look. Lyocell is a wrinkle resistant fabric, so great for vacation if it needs to be packed into a suitcase. The bright line of pearlescent buttons adds a unique touch to this piece. 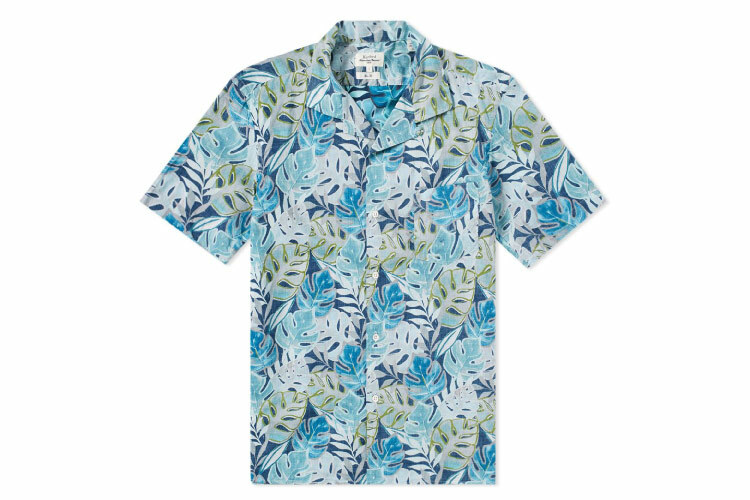 If you’re looking for a more typical tropical feel, this shirt is an eye-catching mixture of light blues and greens. 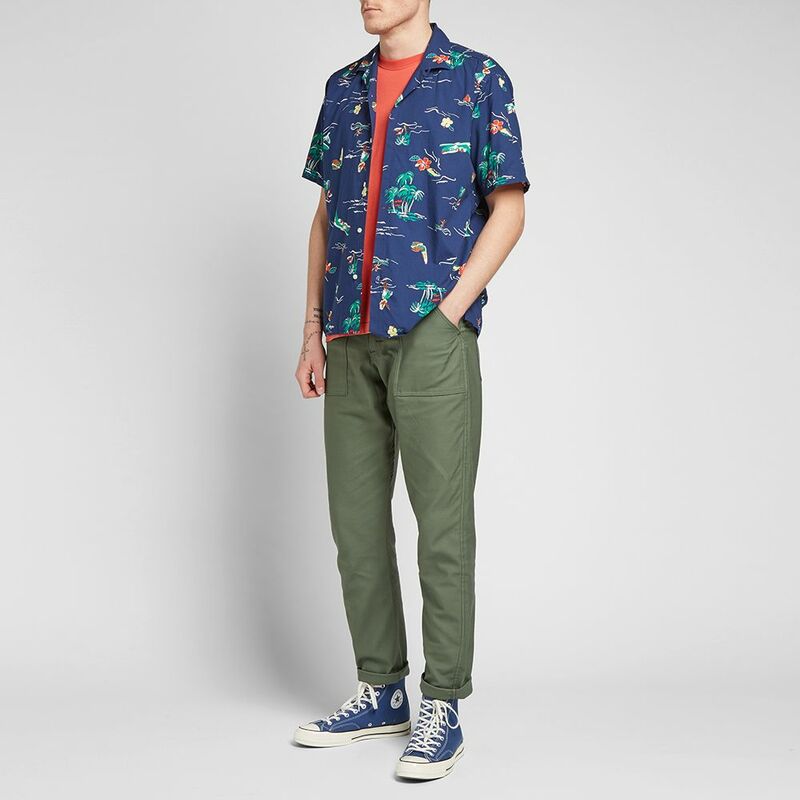 This option offers a slightly more fitted structure, which pairs nicely with shorts, creating a unique but casual look. I’d recommend choosing a pair of light-colored shoes to accentuate the bright and breezy feel of this shirt. If you’re looking for a more business-casual outfit, this striped shirt is great for everyday wear. Made from 100% cotton, this shirt offers a more simplistic style which is versatile, pairing nicely with shorts or even a light-weight blazer. One unique detail is the white woven A.P.C. patch, though not a detail that is everyone’s preference. 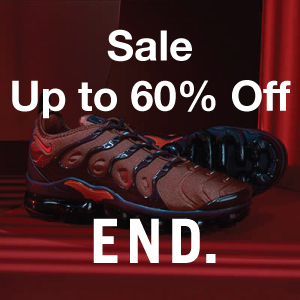 For about $159, you’ll be able to get a lot of wear out of this option. Taking a step back from bright and bold, this shirt offers a dark navy field of pale-yellow peonies. Constructed in a box-style with a straight hem, this shirt styles wonderfully over a simple t-shirt with pants that are colored to coordinate with the tones of the shirt. For about $200, this Tencel fabric piece is a great option for this summer. Keeping with the theme of muted tones, this ‘Miyagi’ shirt displays an array of green flowers with highlights of royal blue. Made of rich Italian fabric and crafted in Portugal, this item costs $175 and is well worth it. The relaxed style works well with loose-fitting pants and you’ll find yourself comfortable, despite the weather. 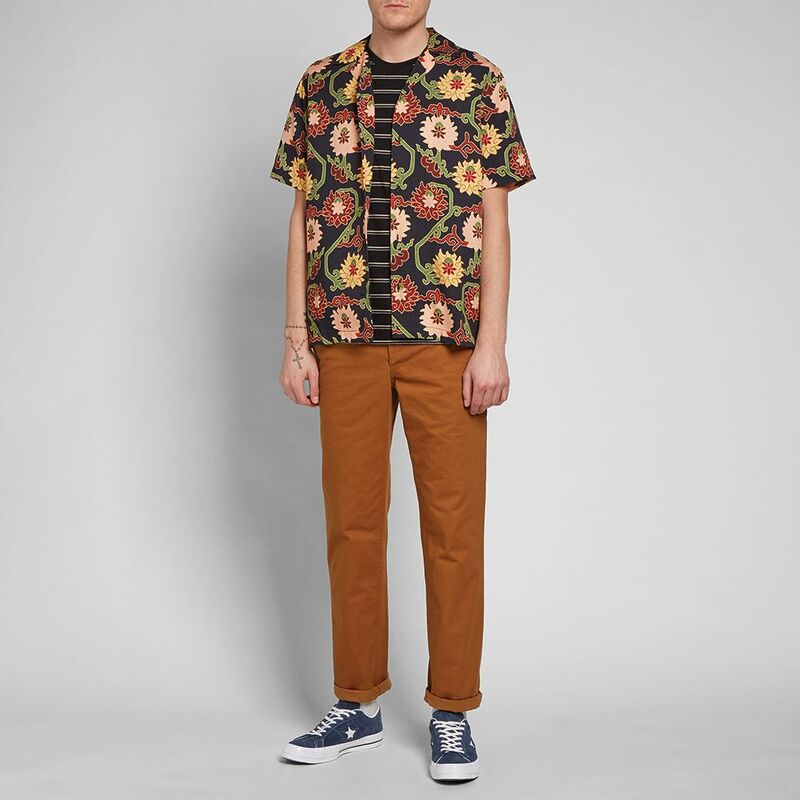 If you’re after a shirt that is bright and bold, the ‘Surf & Turf’ by Gitman Vintage is for you. This print has iconic images of palm trees, a Hawaiian girl doing the hula and Hibiscus flowers. It doesn’t get more summer than this. The fabric is a mixture of 50% cotton and 50% Rayon, giving a silky feel and the loose fit allows for breathability. Being made in the USA, this shirt is going to cost you a great deal more than the others at around $245, but it is of superb quality. Incorporating brightly colored and patterned shirts into your summer wardrobe can sometimes be a challenge. Once you have a few staples, the styling will become easier. You’ll find yourself working with brighter pieces to style alongside these eye-catching shirts, just try to coordinate the colors of your clothes with the shirts color palette. Adding brightly colored hats and shoes can help make your outfit look more tied together. If you opt for more muted tones, you can include neutral pieces that have white, tan and brown. Try to avoid heavy, dark colors to keep in alignment with the summer season. Don’t hold back from brighter colors, just remember to coordinate. Follow these guidelines and suggestions and you’ll be more than prepared for this summer.